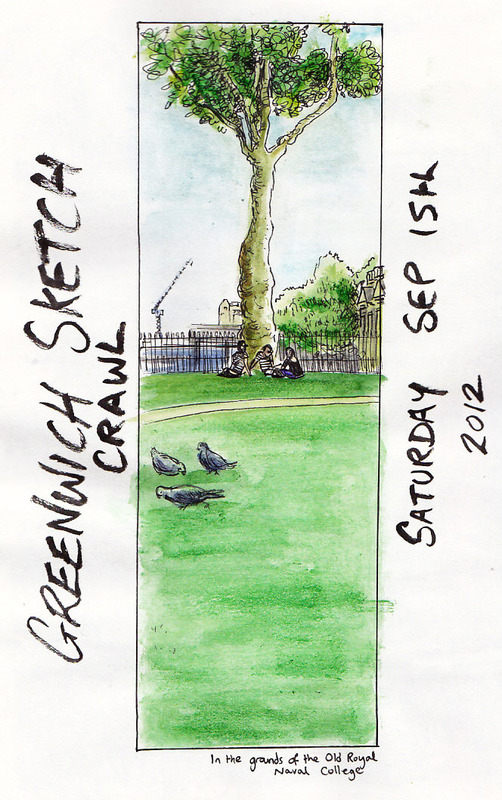 It was a good day at Greenwich on Saturday for the latest London sketchcrawl, excellently organised by Nathan to the extent that even the weather was perfect (how did he do that?). 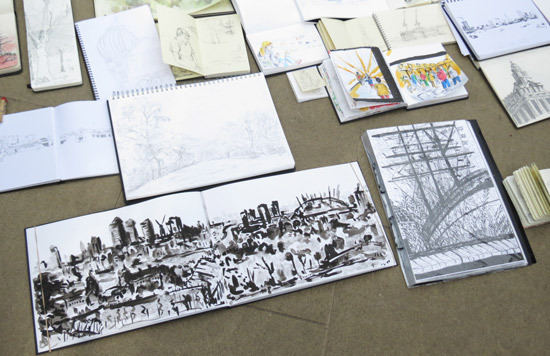 Old friends, new friends and plenty to draw: a great combination. I headed up the hill in the park, past the Olympic equestrian stadium, which still stands for now, to the Observatory. 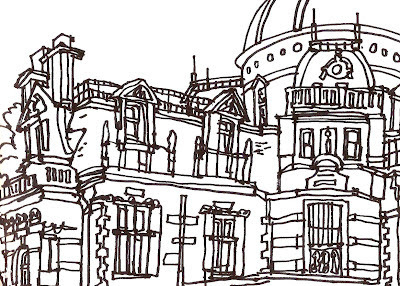 The view, as drawn by Katherine Tyrrell and many of the others, was remarkable in its clarity, but I turned to the closer architectural features of the astronomical buildings, old and new. I'm going to be back to Greenwich soon with the family. 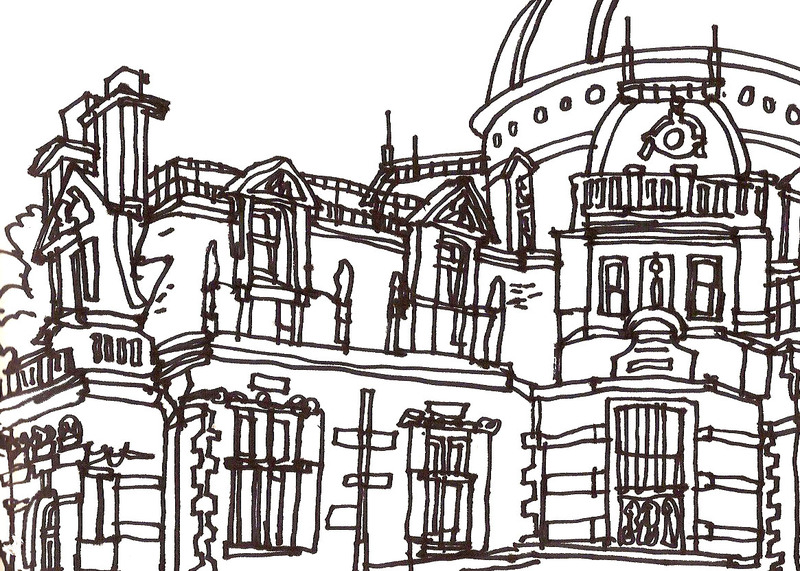 Drawing this planetarium and not going in was a struggle — I was keen to get down to the bottom of the hill to see the work of the other artists. 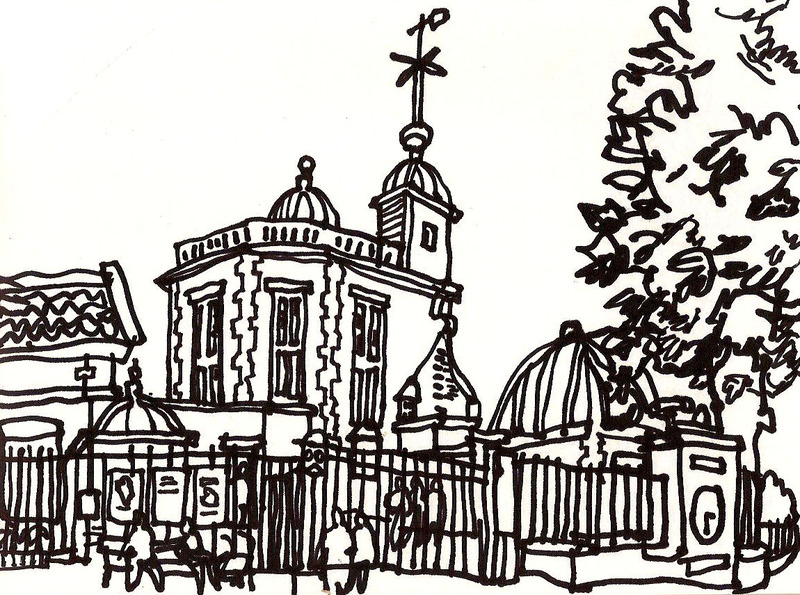 You can see more at the London Urban Sketchers Flickr group. 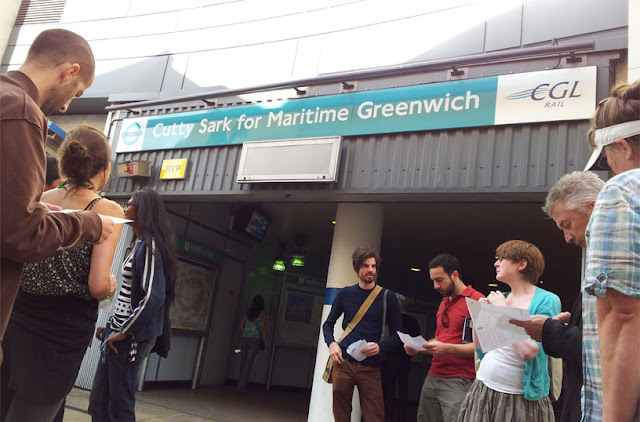 If you passed through the Cutty Sark DLR station at 11a.m. 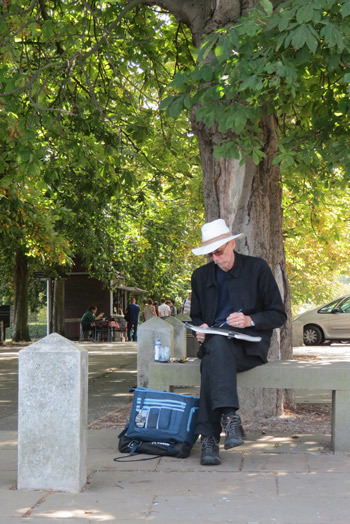 on Saturday, you would have been hard pressed to miss the large group of sketchers gathered there for the start of the 2nd Urban Sketchers London sketchcrawl. 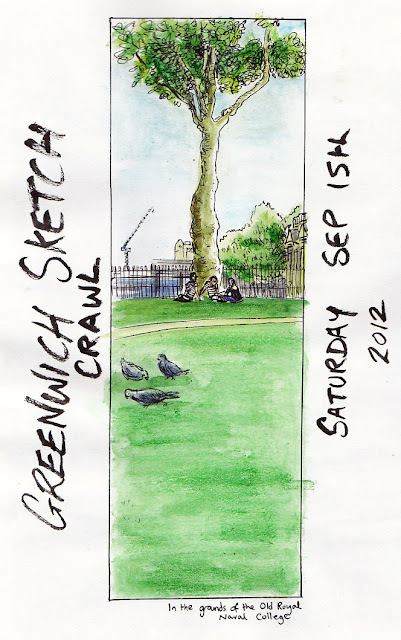 All in all, over 50 people showed up to draw Greenwich on a beautiful sunny day. I should say thanks to the Drawing London on Location group on Meetup.com for helping spread the word. It was very inspiring meeting so many talented artists with so many diverse styles and approaches, and I'm only sorry I didn't get to see more of other people's work and watch everyone in action. 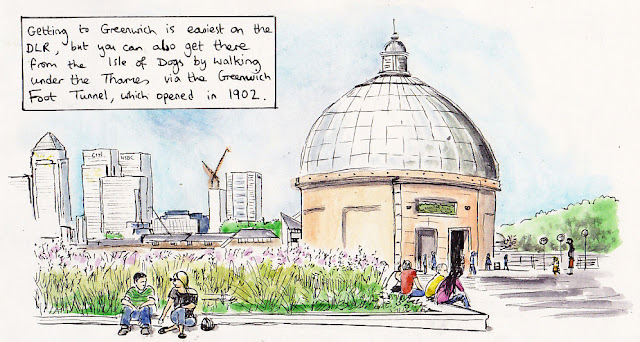 Although I love Greenwich Park, and am excited to see it open again (at least, most of it is) after the Olympics, I knew I'd be spending most of my time around the waterfront - with both the Greenwich Foot Tunnel and the Cutty Sark ship recently being unveiled from beneath the scaffolding and boards they've been shrouded in for the past year or two, this area feels quite fresh and new to me, and I was keen to get acquainted with it. I managed the above and started on a view of the Foot Tunnel before lunch came - fortunately I didn't have far to go, our midway point was right where I was sitting! 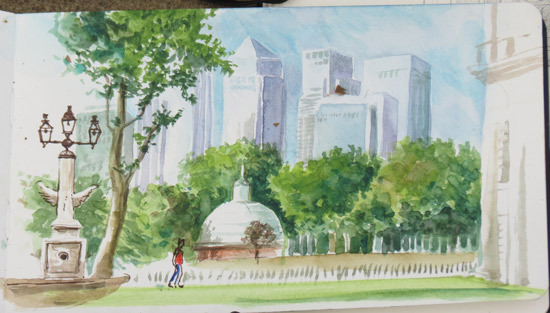 By the time I finished this drawing I realised I was running out of time, so I hurriedly made my way past Greenwich Pier and into the grounds of the Old Royal Naval College, where the sight of this tree attracted me. Because I felt I had to be quicker with this one, I deliberately cropped my sketch to this narrow column, which actually proved fun - I think I may experiment with more oddly shaped compositions in future rather than the usual 'picture frame' shape. 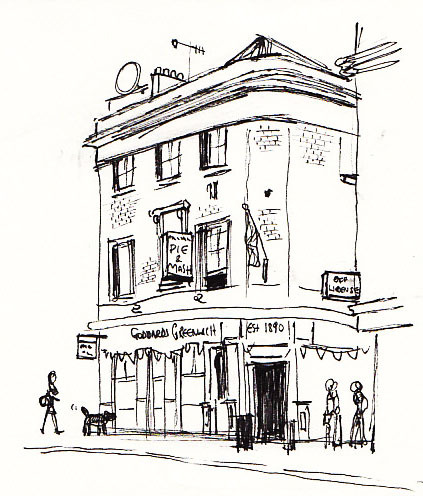 The last picture I did was a quick sketch of Goddard's Pie & Mash shop. 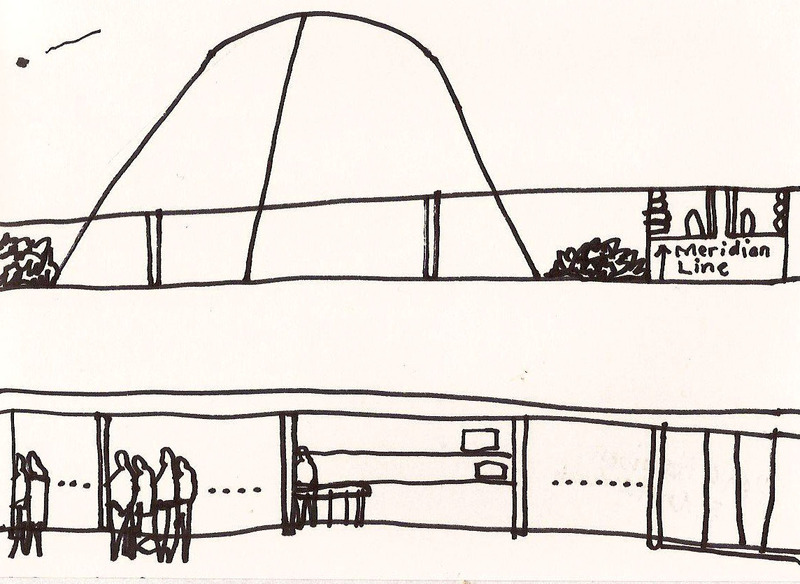 I was fond of the original, which I have also sketched in the past, although the site is now Gourmet Burger Kitchen; earlier this year they reopened in a different location, and I felt I should try and draw this new establishment too. For lunch I bought a takeaway single pie and mash here, however I didn't get to enjoy it as it was pilfered by an ambitious pigeon when my back was turned. There was just time to get to the end point for 4pm at the park gates where we had a group photo taken by Osman, a photographer for local paper the News Shopper. Unfortunately, I didn't get to have a good look at everyone's artwork when it was laid out, as it was pretty crowded, so I hope I get to see more on the Flickr group for those who feel like posting their work (there's already a lot of great stuff up there!). 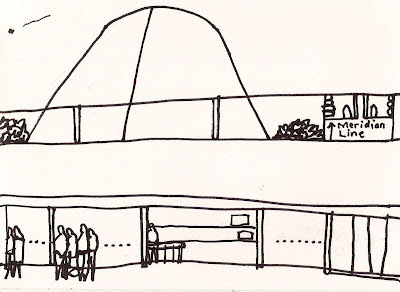 I always find it hugely inspiring to see the different ways in which people tackle the same or similar subjects. Thank you to everyone who came along for making it a success, I look forward to meeting you all again on future crawls! What a great turnout for the 2nd London Sketchcrawl! I was only able to stay for the morining, but I saw lots of exciting work shared at lunchtime. If anyone is interested in this monotype technique, try googling 'Golden acrylics dry monotype' and you'll find something about it I'm sure. There's a YouTube video produced by the Golden Acrylics company that explains the basics - after that it's down to you to experiment! Yesterday we had a fine and very sunny day in Greenwich for the 2nd Urban London Sketchers Sketchcrawl. We'll be posting our sketches in the next few days - but to get us started here are a few photos from the day which was very ably organised by Nathan Brenville. 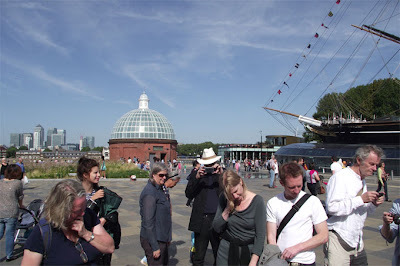 If you were on the Sketchcrawl, please also post sketches and photos of the day to the Urban Sketchers London Flickr Group - but you need to be a member of the group first. If you're not already a member please ask to join the group (click "Join this group" in the menu at the top of the Group page). We'll be posting in the near future about the process of how to join Urban Sketchers London as a correspondent on this blog - but please bear in mind we'll need to see your sketching and writing online first. 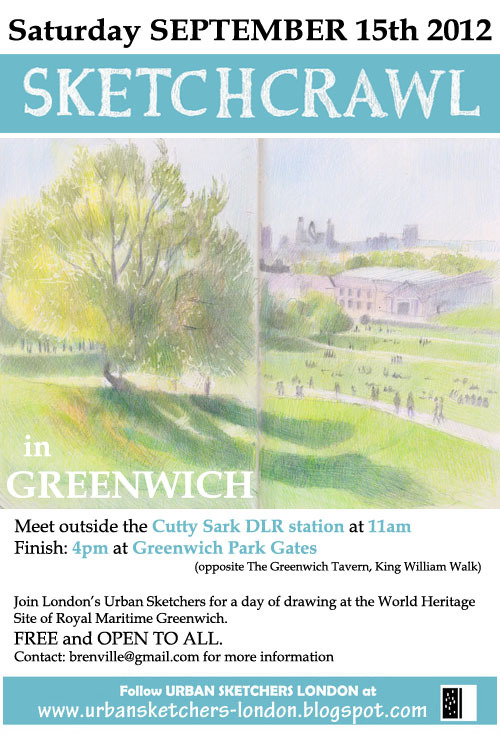 Tomorrow we meet at the Cutty Sark DLR Station in Greenwich for the 2nd Urban Sketchers London Sketchcrawl. It starts at 11am and finishes at 4pm. 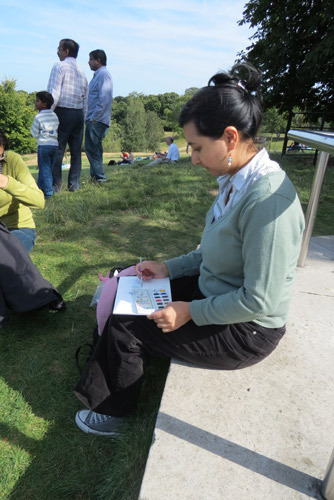 There's no set route and there's lots and lots of places to sketch! 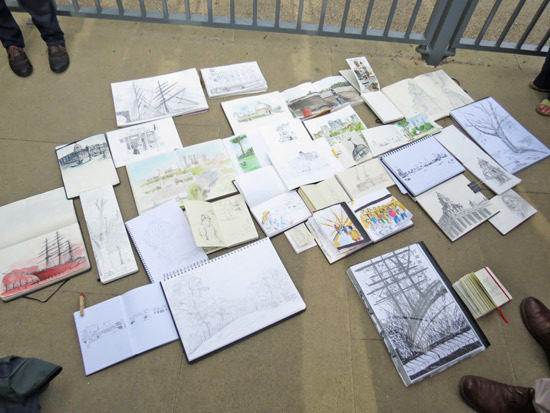 This sketchcrawl has been organised by Nathan Brenville who we met on the 1st Sketchcrawl around Fleet Street and Temple! Contact him for more information - see above for email details. 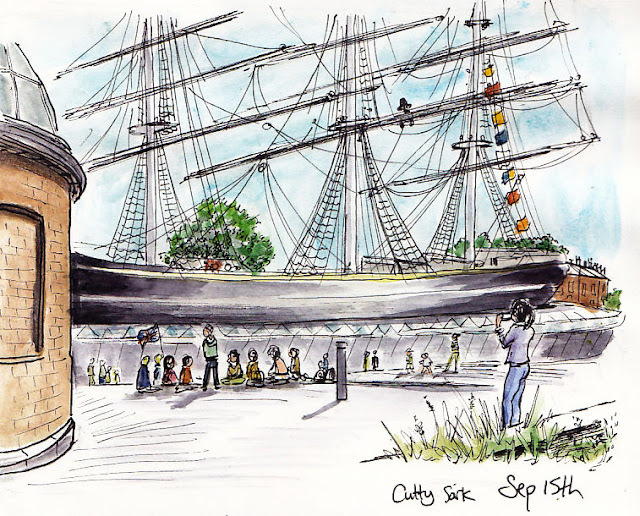 At the moment we're expecting about 50 people to turn up - so why not come along and meet up with people who like sketching! 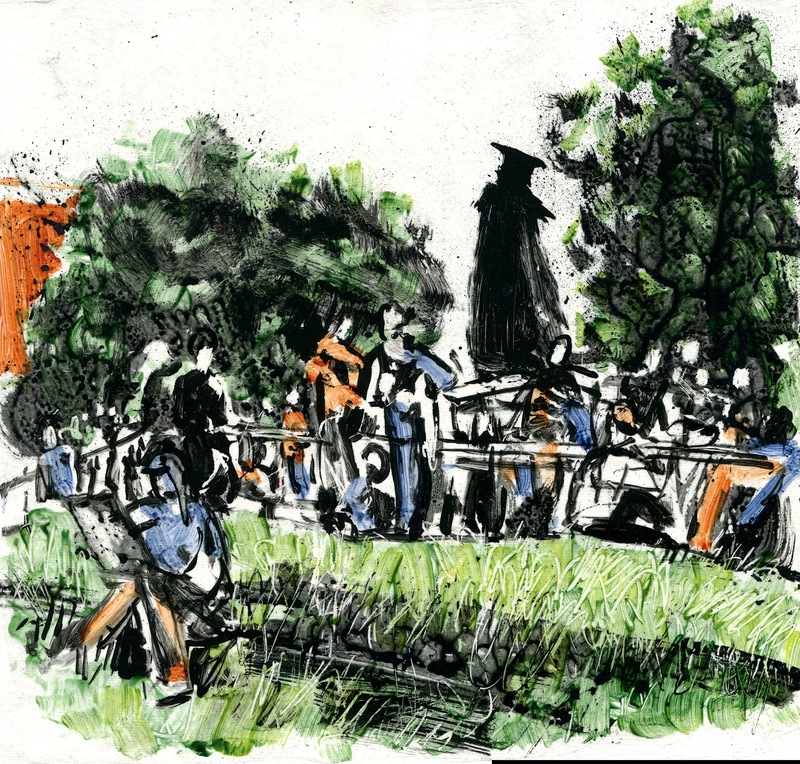 This sketch was done sat at one of the tables next to the windows looking out at the view. 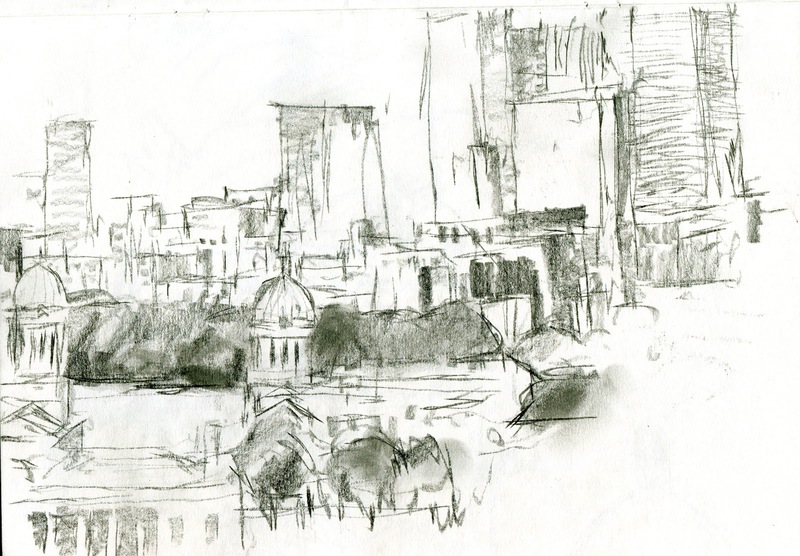 In the background is the dome and structure of St Paul's Cathedral. 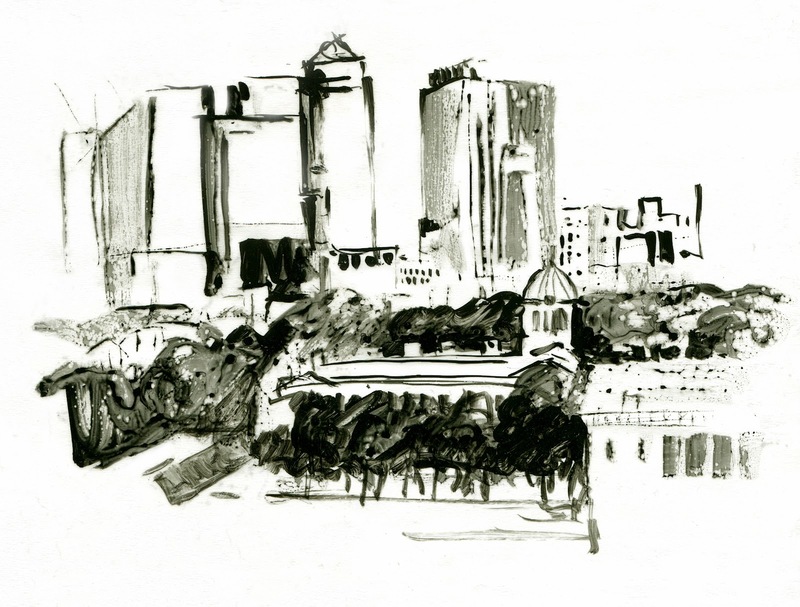 In the foreground is the City of London School and the Millennium Bridge. 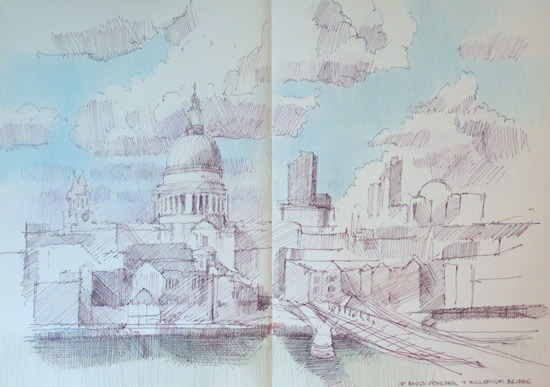 One of the other attractive features of sketching from a position which is so high up is that you also get a brilliant perspective on some great clouds.